On the Cover: Union College students in "Lakes and Environmental Change" course gather while sampling sediment from frozen Ballston Lake New York in January, 2004. See related article. This paper presents the results of testing a Web-based Interactive Landform Simulation Model (WILSIM) in a general education physical geography course. The goal was to determine whether the simulation exercise improved students' scores on tests administered before and after the exercise. Although the mean of post-test scores were slightly higher than that of the pre-test, the difference was not statistically significant. Further analysis of the tests questions suggests that the specifics of the design of the questions are very important to accurate assessment of student learning. Questionnaire results, however, strongly showed that students felt that WILSIM helped them learn. They particularly liked its capability to visualize and animate landform evolution processes, its interactiveness in exploring different scenarios, and its ease of use. We also conclude that more preparation work such as instructor-led introductions, demonstrations, better questions, and simulation scenarios designed with specific objectives in mind and in the context of real world landforms would help in achieving the full potential of WILSIM. The Union College (New York) course Lakes and Environmental Change balances the practical constraints of offering a field-based limnology / paleolimnology course during a winter term without the availability of a large lake or research vessel. Reliable ice conditions and an abundance of nearby small lakes assure a variety of candidate lake systems. Beginning with drainage basin analysis and progressing through water-column measurements, analysis of spatial distribution of surface sediment characteristics, and culminating with collection and analysis of sediment cores, this inherently interdisciplinary course ties together aspects of geochemistry, ecology, sedimentology, and physics. We compare two lake systems each year and in most cases the field and laboratory work represents some of the first limnologic work done on the lakes. Through this systematic framework for investigating each year's lakes, the course resembles an authentic research project, rather than a series of unrelated lab exercises. Classroom activities consist of lectures and literature discussions divided about equally between limnology and paleolimnology. Lab exercises take place in the field, where students learn to use a variety of field gear, and in the laboratory, where students master techniques for sampling and analyzing sediment cores. A basic goal of historical geology courses is for students to gain an understanding of the methods, theories, and logic used in interpreting geologic histories. This is traditionally taught as a series of individual, isolated lessons in identification of rocks, fossils, and sedimentary structures and interpretations of radiometric dating, sequences of events, past depositional environments, and past tectonic events. A supplemental project incorporating these lessons teaches students to evaluate different types of data and use critical thinking to reconstruct a geologic history. Here, a semester-long, group project has been developed that allows students to use their lab- and classroom-honed skills on real rocks in a field setting. Our "field area" includes 11 artificial outcrops, representing six rock types. Students must: (1) identify rock types and fossils; (2) calculate radiometric ages; (3) recognize stratigraphic contacts, geologic structures, and cross-cutting relationships; and (4) critically evaluate this data to give a chronological history of past environments, tectonic events, and even climate. Assessment shows that student learning was enhanced greatly as a result. Not only did students acquire more experience and a deeper understanding in the mechanics of historical geology, they also gained an appreciation for the work required to interpret a geologic history. Teachers of sediment-related geology courses should consider taking their classes on field trips to exposed reservoir bottoms. A wonderful variety of fluvial, deltaic, and lacustrine features and processes can be observed there. A visit to a modern sedimentary environment such as a reservoir bottom gives students important personal experience that they can draw on when learning to interpret sedimentary rocks using the principle of uniformitarianism. It can also inspire investigation of a range of related geological and environmental issues. Many classically- educated geologists have found employment as engineering geologists or hydrogeologists, gaining the technical knowledge and skills they need through experience and self-education. Ideally, these individuals would learn the necessary subjects in their undergraduate classes and have a shorter learning curve on the job. There are many degree programs that prepare students specifically for these fields, but students may also be prepared within a standard geology program, with some modifications. The purpose of this paper is to suggest ways of preparing students to enter work or graduate studies in engineering geology or hydrogeology through the standard geology curriculum. Critical technical skills, such as use of the Unified Soil Classification System or air photo interpretation, must be taught as additional topics in existing classes. Problem-solving and analytical thinking skills can be taught through a variety of exercises that enhance the geology curriculum without adding new topics, including in-class discussion questions, homework and laboratory problems, and add-ons to mapping and semester projects. Other educational experiences to prepare undergraduates for careers in engineering geology and hydrogeology include interaction with professional associations, internships and co-ops, and professional registration. National science education standards emphasize actively engaging students in developing their abilities in and understanding of scientific inquiry as a way to learn important concepts in the earth sciences and other disciplines. Too few high-quality instructional tools, based on the national standards, currently exist that model this type of activity for sixth-grade students. To promote this approach, we created a national laboratory/middle-school partnership to develop a hands-on, inquiry-based research project related to flash floods in southeastern Washington State. The project, conducted during the 2003-2004 school year, built on the middle-school Catastrophic Events module developed by the National Science Resources Center. Seventeen student research teams deepened their understanding of geology, hydrology, and meteorology and applied this understanding as they analyzed and evaluated data they collected. The student teams wrote technical reports and created posters that synthesized the data and presented conclusions and recommendations based on their findings. The project models a successful approach for developing an inquiry-based earth science project and creating a meaningful partnership between schools and scientists. This study analyzes responses to a researcher-developed science assessment given to students before and after their participation in a high school marine science course. While a paired-sample t test revealed a significant improvement (p < 0.001, t = 4.42, n = 399) on the post-instruction science content assessment, achievement gains were small based on Cohen's measure of effect size (d = .22) and varied among the nine teachers' classes. Student performance significantly improved for all groups of questions, with small gains for questions on the flow of matter and energy and the properties of water and less than small gains for questions about Earth's geologic history and interactions between the ocean and atmosphere. The results, based on improvement of students in two teachers' classes, indicate that marine science can be used as a successful model for teaching integrated science if curricula and instructional activities, assessments, and teacher education programs are aligned to the National Science Education Standards (NSES). This study investigates differences between a curriculum based on the National Science Education Standards and curricula following two traditional textbooks. 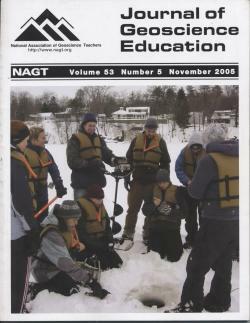 Earth System Science in the Community (EarthComm) and the "most used" high school earth science textbooks in the United States and Korea were analysed in terms of general features, questioning style, and level of laboratory activities by two experts using Textbook Questioning Strategies Assessment Instrument and Herron's four levels of activities. The inter-rater reliability varied from 0.91 to 0.97 for questioning style depending on each individual book and 0.99 for laboratory activities. The results showed that the standards-based curriculum EarthComm included the largest number of pages and laboratory activities with the least number of chapters and concepts among the three textbooks compared. The standards-based curriculum included by far more questions and the largest percentage of experiential questions compared to both of the most-used traditional textbooks. Non-experiential questions tend to be "open-ended" in standards-based curriculum, "direct information" in the Korean textbook, and both "open-ended" and "direct information" in the most used U.S. textbook. Higher-order questions are featured in standards-based curriculum, which call for inferences and application. These findings explicitly stress that high school earth science textbooks should be inquiry-oriented in teaching and learning. The study further discusses its meanings and implications for student learning in earth science. Humor in the classroom has been shown to have many positive effects on attention, attitude, and engagement in higher order thinking skills. This study examined the effect on motivation and science performance of using humorous cartoons to teach mineral and rock concepts to sixth grade students as compared to more traditional methods. Four classes of students were randomly assigned to two groups, A (N = 30) and B (N = 33) that alternated between conditions for two units: minerals and rocks. Performance was determined using open-ended identical pretest/posttest instruments. Both groups received quality instruction on concepts addressed by the assessment, accessed the text, examined specimens, worked in cooperative groups, and attended class for equal amounts of time. Experimental procedures included viewing cartoons, interpreting the science facts, identifying the humor mechanism, improving cartoons, completing given cartoons, and creating original cartoons. Control procedures included lecture, discussion, written exercises and creation of a study outline. Students in the experimental condition exhibited higher motivation and significantly higher gain scores than students in the control condition (23.5% gain compared to 12.3%). Cohen's effect size was large, 0.953. Students' higher performance is attributed to their intense engagement with the content through the scaffolded cartoon activities. One of the major misconceptions among students of all ages is the cause of the change of seasons. A middle school science teacher and a professional geologist teamed up to construct a combined "hands-on/ minds-on" lesson to demonstrate the cause of the change of seasons. Two writing exercises were employed to further cement the lesson and allow assessment of student comprehension. The "hands on" activity required the students to maneuver a globe at a constant 23.5 degree tilt around a stationary light source and then draw the pattern of light as it reflected on the globe. The students were encouraged to visualize how the Earth's relative position to the sun affects the change of seasons. They then wrote a five-sentence portfolio entry upon reflecting on their newly learned concepts. In an additional "minds on" activity, the students constructed a three-lined science poem (haiku). Evaluation through rubric scoring indicated that 82% of students significantly improved their conceptual understanding of seasonal change through the use of haiku. Additionally, it appears that differing levels of knowledge, (per Bloom's Taxonomy) were assessed with each technique, as the haiku appeared to represent higher order thinking due to the synthesis skills that were required for its completion.